All natural - only ingredients that chickens enjoy, ensuring that they eat every delicious morsel. High in protein. Reduces boredom and pecking. 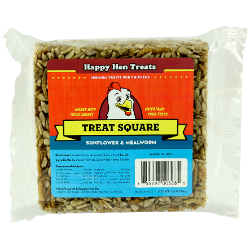 Available in the following flavors: Sunflower & Mealworm, Peanut, Raisin & Mealworm, and Seed & Mealworm.